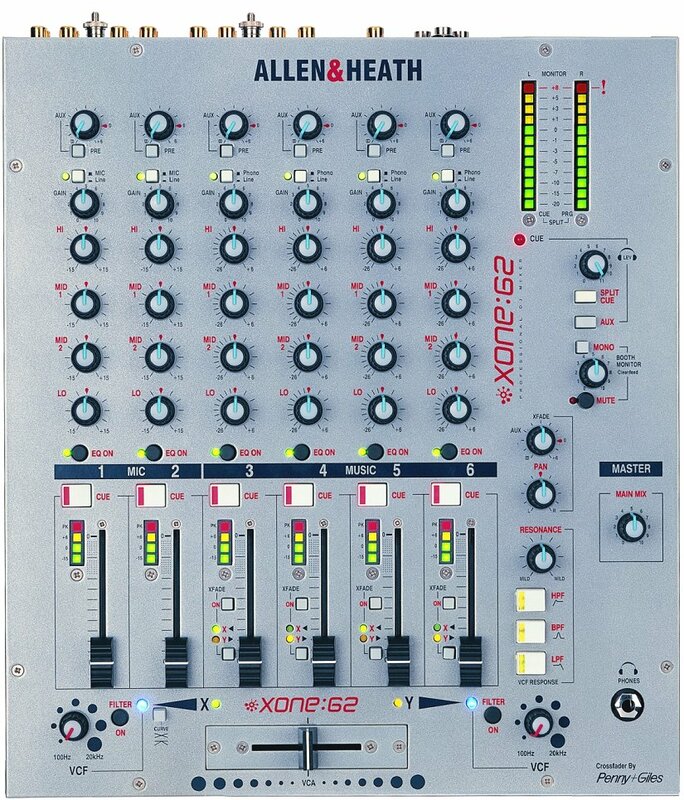 Allen & Heath Xone:62 Mixer DJParts - All Variety of Parts that DJ Needs. 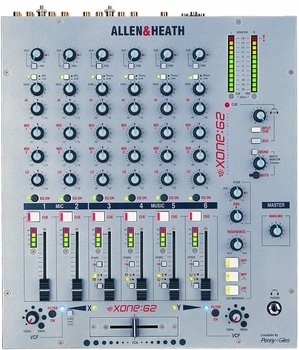 Allen & Heath Xone 62 Mixer is a 6 Dual Stereo Channels CH 1&2 have XLR Mic inputs and [TRS] stereo line level inputs, with ‘corrective’ EQ. CH 3-6 have stereo RCA RIAA turntable inputs and stereo RCA line level inputs, plus powerful 4 band ‘music’ EQ. All channels have 3 colour bar meter and gain control, EQ on switch and 60mm fader. CH 3-6 have X-fade assign section. Stereo Mix Outputs Balanced mix outputs on XLR with level control, plus secondary RCA ‘music only’ outputs for recording. A post fade [TRS] mono sum output is also provided. The mix signal is displayed on 12 segment 3 colour bar meters Auxiliary Send All channels have a stereo auxiliary send which can be individually switched pre or post fade. There is also a post crossfader send to this stereo aux, so a program feed to a zone is possible. The outputs are [TRS] jacks. 4 Band EQ Powerful 4 band EQ with ‘asymmetric’ characteristic on CH 3-6; +6dB boost to preserve headroom and -26dB cut for creative mixing. CH 1&2 have ‘corrective’ EQ for mic & line control. EQ on switches are provided VCA Cross Fader Conductive plastic, high quality 45mm Penny & Giles fader with curve switchable to cut or dip. channels 3-6 can be assigned to X left side or Y right side, with green / yellow led indication. The fader is a VCA design, so wear and tear does not affect audio. Drop-in replacements. Resonance adjusts Q from ‘mild to wild’. Sweep controls from 100Hz to 20kHz with blue led on switch Engineer / DJ's Toolbox High powered headphone output with level. ‘Music only’ Booth output on [TRS] jacks with level. 12 segment 3 colour bar metering displays mix or cue/monitor section. Channel cue overrides the monitor selected in the phones [option for post-EQ on CH 3-6]. Mute kills booth monitor output. Booth Mono sum button for phase and compatibility check PSU High performance internal switched-mode power supply.